More than half of Americans (54%) who experience lower back pain – spend most of their workday sitting. But you don’t need these statistics to know that sitting too much can aggravate back pain and even cause lumbar pain in the first place. Lumbar pain from sitting all day can be quite easily prevented and solved, and this post will show you the 5 easiest and best ways to fix office-work related back pain. 1 Why Does Sitting Too Much Cause Low Back Pain? Why Does Sitting Too Much Cause Low Back Pain? Sitting in an office chair for long periods of time, in this unnatural static posture, increases stress in your back, shoulders arms and legs. It especially adds a lot of pressure on your back muscles and spinal discs. When you sit four hours and hours, you tend to slouch over or slouch down in your chair, which over-stretches the spinal ligaments and strain the discs, muscles and nerves around it. Note: If your lower back pain is radiating to your legs and buttocks, this may be a sign of a pinched nerve, Sciatica or bulging/herniated disc. Below you’ll find 5 effective and natural ways to prevent and get rid of back pain from sitting, which won’t require much effort on your part. When you want to get rid of posture related low back pain, you’ll have to pay attention to your sitting posture and your chair, and start using a few very helpful tools to relieve your pain naturally and fast. 1. Sit at the edge of your chair and slouch completely. 2. Draw yourself up and accentuate the curve of your back as much as you can, and hold there for 2 seconds. 4. Rest your elbows and arms on your chair or desk, keeping your shoulders relaxed. 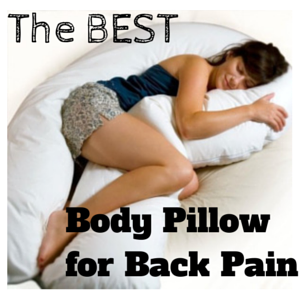 You are now sitting in the best posture for your back. You have to keep your hips and knees at a right angle (use a foot rest or stool if your chair is too high). Your legs should not be crossed and your feet should be flat on the floor. This takes time to get used to, and when we work we tend to forget about it and unknowingly slouch back to our usual posture. Either use a good lumbar back support cushion (like this one), or get a good ergonomic office chair (like this one) – to help you keep the right sitting posture for the entire workday. (We’ll get to the best office chair to prevent lumbar pain below). What to do if sitting too much has already got your back pain going? No matter how great your sitting posture and how excellent your chair is – you have to take a few breaks from sitting during the day (at least once an hour). Sit in your chair, making sure your sitting bones are firmly in contact with the chair. Keep your feet flat on the floor and placed wide apart. Sit up tall and then slowly slide your hands down your legs until you reach the floor. Visualize rolling down one joint at a time, head first. Breathe into the stretch and try to slide slightly further down. Hold for 30 seconds. You can find more simple and effective “deskercises” HERE. For a more powerful stretch, I recommend bringing a compact, portable back traction device to your office space. When you do back traction, your aching muscles get a chance to relax and you take a bit of the pressure off your discs. The True Back stretcher is a portable and compact lower back lumbar traction device, and easy to use. No assembly is needed and no parts can break down – ever. If you want to relieve your pain while you sit and work uninterrupted – infrared therapy is one of your best options. Infrared heat penetrates deep into your muscles, up to 4 cm into your tissues – increasing local blood circulation and bringing pain relieving and healing components – faster. 1. Shiatsu infrared heat cushion – using an infrared heat cushion, combined with infrared heat – is an effective way to relieve lumbar pain without interrupting with your work. For example, this low-cost cushion has 4 deep-kneading rotating nodes with soothing infrared heat, and has a car adapter. You can also get a full-back infrared heat shiatsu massage cushion – see my reviews for the 3 best ones HERE. 2. Infrared heat belt – this Jade stoned infrared heat belt (with negative ions) can be wrapped around your lower back comfortably and is made of high quality materials. It comes with digital controller and a timer – and it’s perfect if you don’t like massage and just want to enjoy the deep penetrating and soothing heat to relieve your back pain. A lower cost option is this infrared heat belt, which delivers infrared rays via carbon fibers. Note: do not use infrared heat belts if you are pregnant or suffer from a serious health condition without consulting with your doctor. Small, wireless TENS machines allow you to use your TENS unit with a remote control – without attaching any wires to the electrodes, and without any wires hanging out of your pocket – perfect for office use. I recommend the budget-friendly AccuRelief Wireless TENS Unit. One of the most important factor to change when your back hurts from sitting – is your chair. The National Institute of Health recommends choosing a chair with all of the necessary adjustments to support proper posture. Lower back support in an ergonomic chair is very important. Sitting for long periods of time without supporting the inward curve of your back causes slouching (which flattens this natural curve) and causes strain to the low back muscles. I know you probably don’t want to spend a lot of money on a chair, so I found the most cost-effective ergonomic chair to help you prevent back pain and increase your productivity. You can get the Alera Elusion Series Chair for less than $200 (sometimes) on Amazon. You can find instructions to adjust your ergonomic chair HERE. Note: through my personal experience and a lot of trial and error, I’ve discovered the best chair for me is a balance ball chair. See my post about why I switched to it HERE. When standing up from a sitting position, move to the front of the seat of your chair. Stand up by straightening your legs. Avoid bending forward at your waist. Then, immediately stretch your back by doing 10 standing backbends. I hope you’ve found this post helpful. Please use the comments below to share your experience with us, or to ask any question you may have. This is very helpful especially for those who are working in front of their computers all day. Great article it certainly covered lot’s of reasons back pains are caused and different ways to find pain relief through exercise and proper workouts.